Canada is apparently becoming an attractive place to do business. This week Burger King announced plans to move its headquarters to Canada, via a merger with Tim Hortons. Other U.S. companies that have recently moved or announced plans to move to Canada include Bausch and Lomb, Allergan, and Auxilium. A Bloomberg analysis indicates Tim Hortons was once a U.S. company, until it inverted to Canada in 2009. Part of the attraction is the substantial tax reforms that occurred over the last 15 years in Canada. First among these is the dramatic reduction in the corporate tax rate, from 43 percent in 2000 to 26 percent today. The U.S. currently has a corporate tax rate of 39 percent, but lawmakers are reluctant to do what Canada did, i.e. lower the tax rate, for fear of losing tax revenue. The natural question is: How much tax revenue did Canada lose? 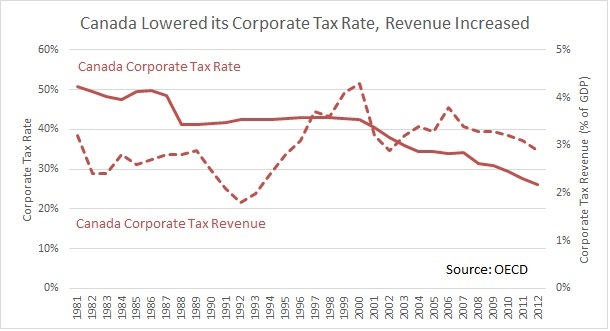 According to OECD data, corporate tax revenue increased following Canada’s corporate tax rate cuts that began in 2000. The first chart below shows the data. Corporate tax revenue as a share of GDP in Canada has averaged 3.3 percent since 2000, while it averaged 2.9 percent over the years 1988 to 2000, when Canada’s corporate tax rate was 43 percent. The second chart shows the same data for the U.S. 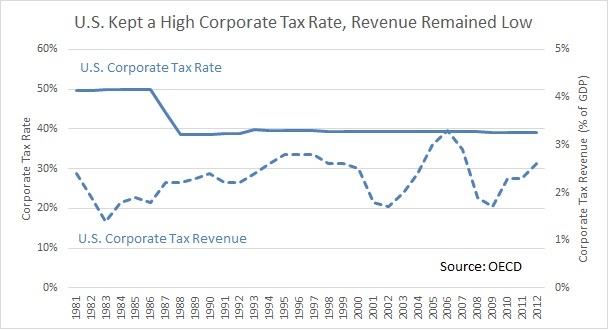 The U.S. corporate tax rate has remained at about 39 percent since 1988, but this has not translated into higher corporate tax revenue. For 15 years straight, Canada has raised more corporate tax revenue than the U.S., as a share of GDP. Since 2000, U.S. corporate tax revenue as a share of GDP has averaged 2.3 percent, compared to 3.3. percent in Canada. Canada's corporate tax base has grown for two reasons. First, multinational corporations, especially those based in the U.S., are attracted to Canada's tax regime. Second, Canada's low corporate tax burden and relatively simple tax code grows corporations organically, i.e. through low start-up costs and reinvestment of after-tax earnings. Next time a lawmaker says we can't afford a corporate tax cut, tell them to look at Canada.